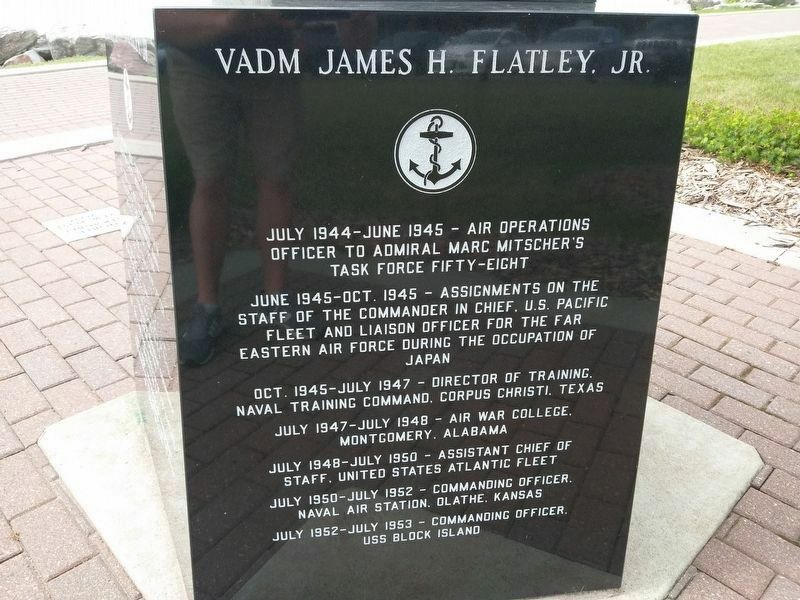 Vice Admiral James H. Flatley Jr.
Vice Admiral James H. Flatley Jr.. "Reaper Leader"—. June 17, 1906 July 9, 1958 Navy Cross May 7 - 8, 1942 Distinguished Service Medal July 1953 - June 1958 Legion of Merit W/Combat "V" Dec. 1944 - May 1945 Distinguished Flying Cross W/Two Gold Stars Nov 1942 - Aug 1943 Bronze Star W/Combat "V" Sept - Oct 1944 Navy Commendation Ribbon W/Combat "V" May 11, 1945 Presidential Unit Citation W/5 Blue Stars 1941 - 1945 American Defense Service Medal Asistic - Pacific Campaign Medal W/Two Silver Stars American Campaign Medal World War Two Victory Medal National Defense Service Medal Philippine Liberation Ribbon W/Bronze Star. 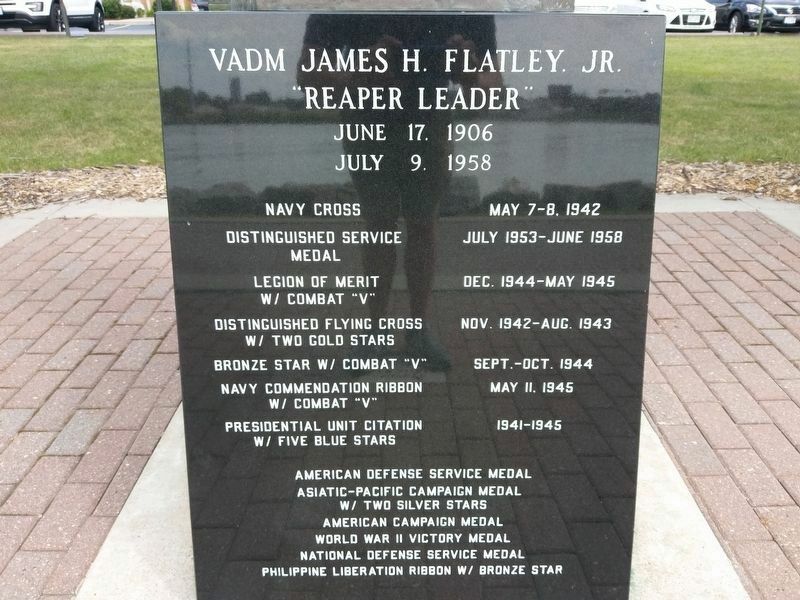 Legion of Merit W/Combat "V"
Navy Commendation Ribbon W/Combat "V"
VADM James H. Flatley, Jr.
May 1942-Oct. 1942 - Trained and commissioned "Grim Reapers"
Oct. 1942-Feb. 1943 - Commander of the "Grim Reapers"
July 1956-Oct. 1957 - Director of Special Weapons Branch Office of the Chief of Naval Operations, Washington, D.C.
Oct. 1957-June 1958 - Director of Air Warfare, Washington, D.C. Location. 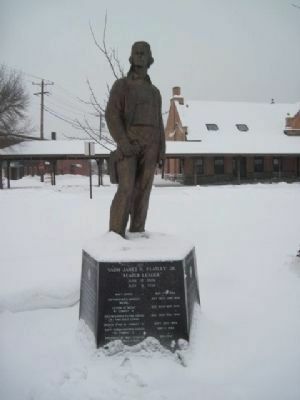 44° 30.642′ N, 88° 1.169′ W. Marker is in Green Bay, Wisconsin, in Brown County. Touch for map. Located in Admiral Flatley Park on the Fox River next to the Chicago, Milwaukee and St. Paul Railroad depot, later known as the Milwaukee Road. See Milwaukee Road marker at this location also. 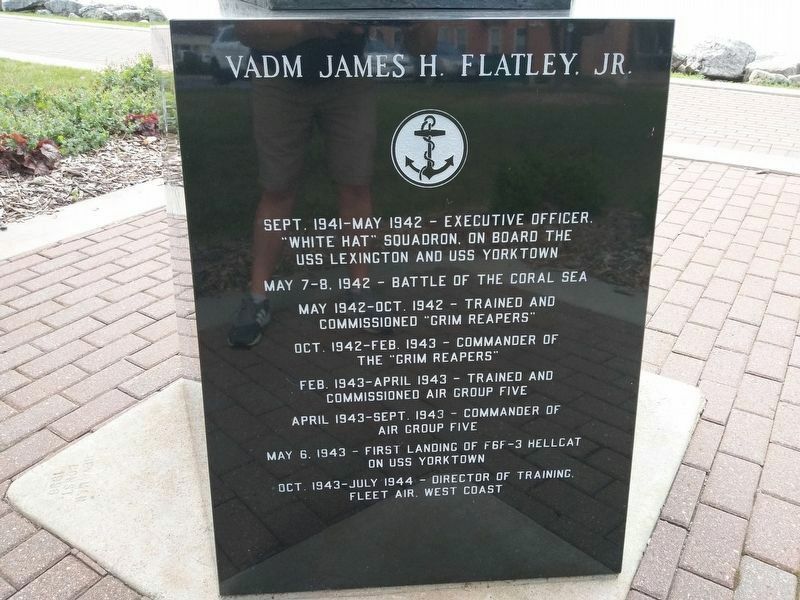 Marker is at or near this postal address: Admiral Flatley Park, 100 Admiral Flatley Ct., Green Bay WI 54301, United States of America. Touch for directions. 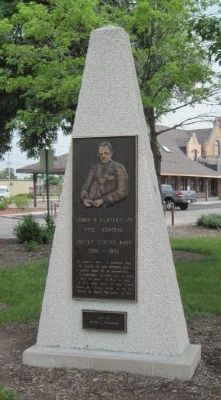 (within shouting distance of this marker); Milwaukee Road Passenger Depot (within shouting distance of this marker); Freimann Hotel Building (within shouting distance of this marker); Packers Office Building (about 300 feet away, measured in a direct line); Influence of the Fur Trade (about 300 feet away); Augustin de Langlade (about 400 feet away); Bank Of Wisconsin (about 700 feet away). Touch for a list and map of all markers in Green Bay. 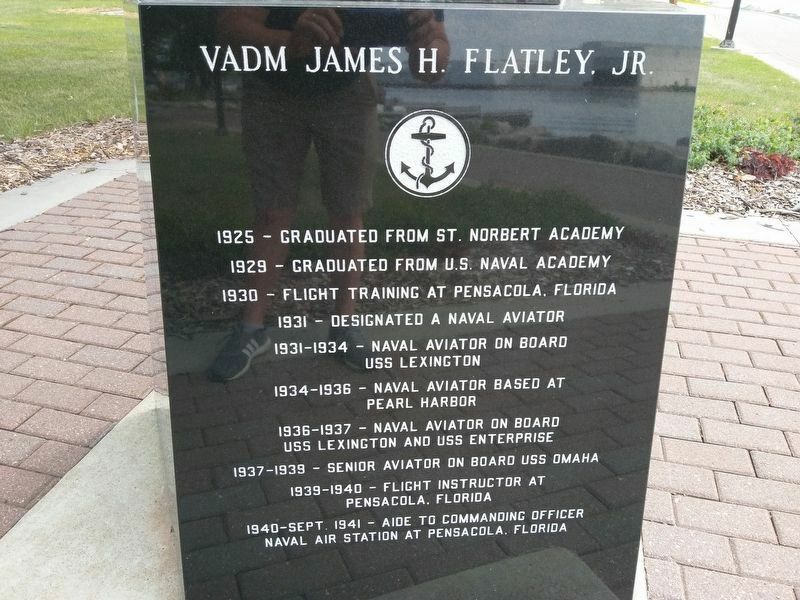 Regarding Vice Admiral James H. Flatley Jr..
Flatley was an aerial-gunnery expert and World War II squadron and air group commander. As Executive Officer of Fighter Squadron VF-42, he was one of the key participants in the Battle of the Coral Sea in May 1942, the first carrier vs carrier duels. A few days before, Flatley had been ordered back to the States to form a new fighter squadron, but he managed to get permission to stay for the coming battle. 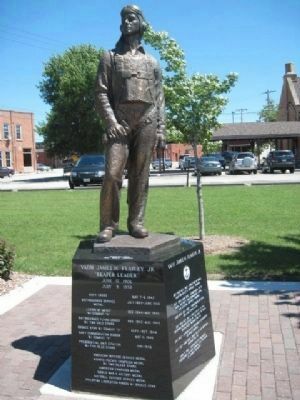 Flatley was awarded the Navy Cross for "extraordinary heroism and conspicuous courage" during the Battle of the Coral Sea. to form VF-10, flying F4F Wildcats. Named the Grim Reapers, Flatley became "Reaper Leader." There were successes at Guadalcanal, but several losses which left him frustrated. As Commander of Air Group Five (CAG-5) on board the USS Yorktown (CV 10), he helped introduce Grumman’s F6F Hellcat to combat in August 1943. Flatley, at the age of 36, never flew combat again. More. 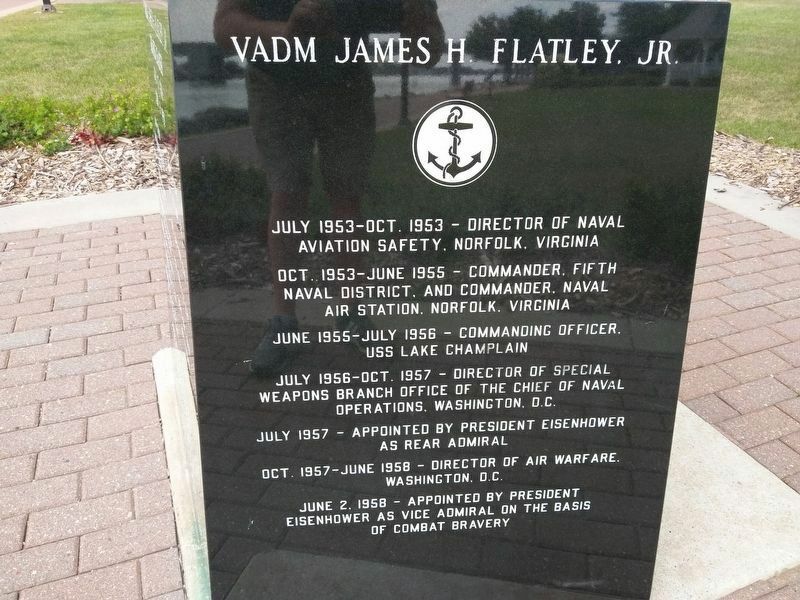 Search the internet for Vice Admiral James H. Flatley Jr.. Credits. This page was last revised on April 16, 2019. This page originally submitted on December 22, 2010, by Bob (peach) Weber of Prescott Valley, Arizona. This page has been viewed 876 times since then and 19 times this year. Last updated on March 28, 2019, by Devon Polzar of Port Washington, Wisconsin. Photos: 1, 2, 3. submitted on March 28, 2019, by Devon Polzar of Port Washington, Wisconsin. 4, 5. submitted on March 29, 2019, by Devon Polzar of Port Washington, Wisconsin. 6, 7. submitted on December 22, 2010, by Bob (peach) Weber of Prescott Valley, Arizona. 8. submitted on June 6, 2011, by Bob (peach) Weber of Prescott Valley, Arizona. • Andrew Ruppenstein was the editor who published this page.